Art and technology have combined to bring you the most advanced stylus yet in digital art - and just in time for Christmas! The Lynktec Rechargeable Apex 2.3 Fine Point Nib Stylus may be a mouthful to say, but it's the most stylish stylus around, with the perfect imitation of putting pen to paper. Forget delays, forget glitches and freezes - the Lynktec Rechargeable Apex Stylus uses innovative circuitry to deliver a realistic pen-to-pad writing experience on your tablet screen. Read on to find out more about what makes this the most premier tool for digital artists and note-takers alike. The Lynktec Rechargeable Apex Stylus uses more than 90% reduction in its fine point tip, compared to most other passive styluses, which means for the first time writing on a screen is as natural as writing on paper. As it's not a pressure sensitive stylus, you don't need bluetooth or any other support software to be able to use it - just switch it on and start using it! It's really that easy. It's perfectly compatible with all iPad devices, as well as most Android devices out there. 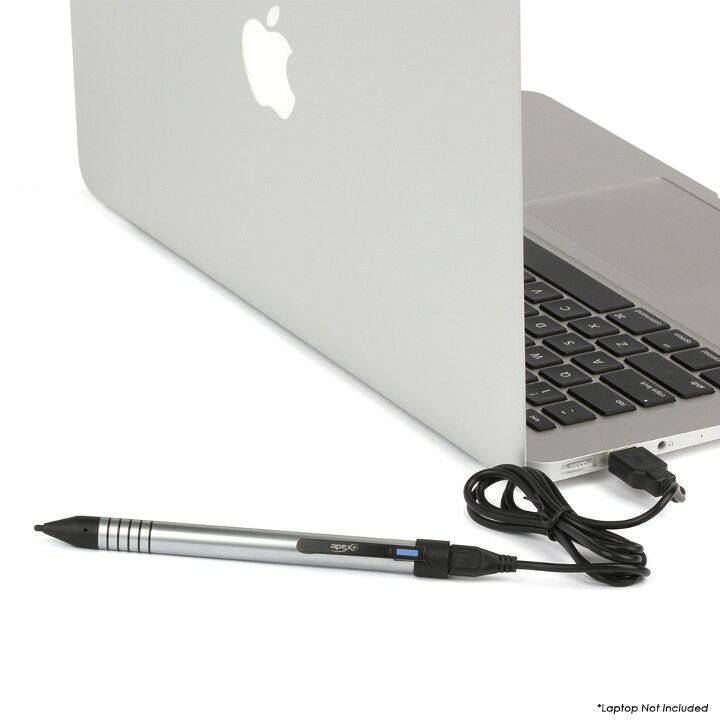 It mimics a quality pen at a length of 6 inches, and this model includes a stylish metal pocket clip, instead of the plastic version on the previous model. It's also much lighter than the previous non-chargeable stylus, and sits at a comfortable 28.4 grams. What's more, the surface will not show your fingerprints, so you can use it to your heart's content and it will still look brand new. It includes a durable replacement nib in the cap that covers the charging point, and also an automatic shut off feature which means you can't unintentionally drain the battery. And if its smooth writing experience wasn't enough, it also comes with a built-in recharageable battery, so you won't ever need spend extra money on replacements. Also, you can't argue with the fact that it looks great - available in satin chrome, it's a sleek, must-have tool for any digital artists this year. So whether you draw on your tablet or scribble your ideas onto the screen, switch on your device, click on the stylus, and let your ideas flow right onto your device. 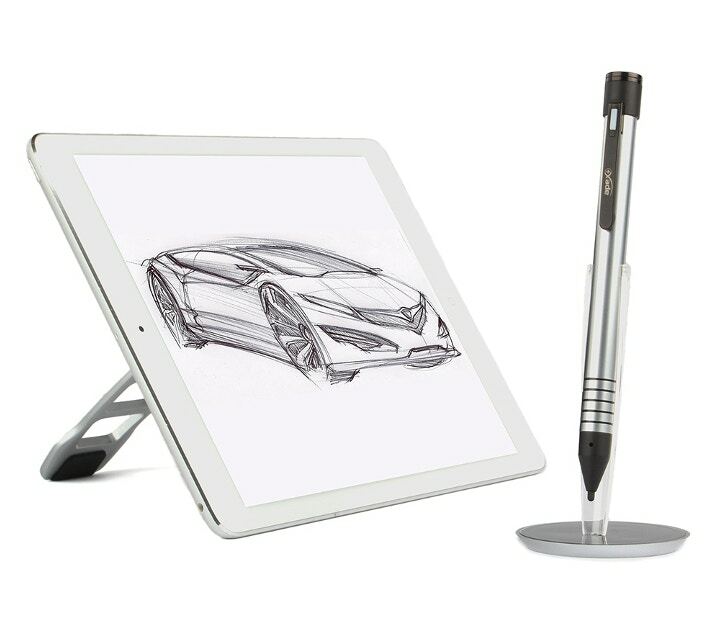 Check out the new Lynktec Rechargeable Apex Stylus here. Prefer a paintbrush to a pen? Last year we celebrated digital art with the Sensu Digital Painting Brush and Stylus, which is now available in silver and a new matt black. Read our How To guide on digital painting here.